Our largest table is the Barbarian at 42 inches tall, with interior dimensions of 4 feet by 4 feet. 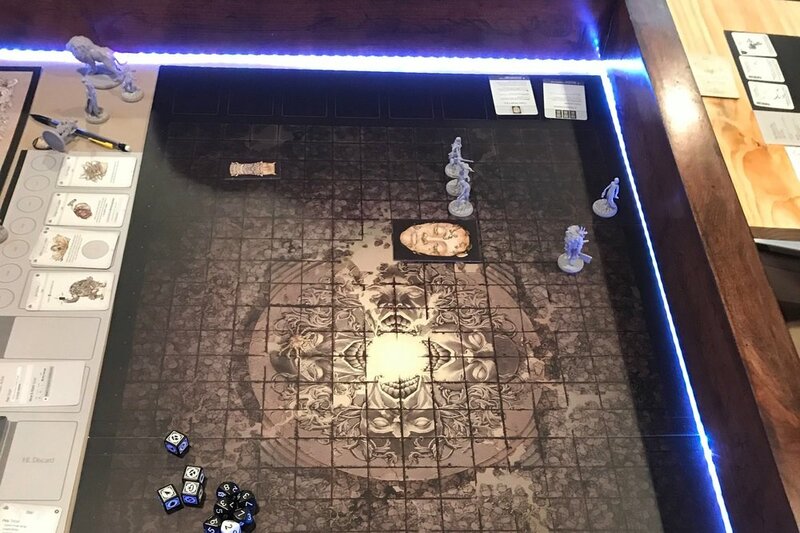 Take your gaming to the next level and rage against the conventional with this beefy pub table. As with all of our tables, dimensions can be fully customized to perfectly fit your needs. We offer two styles of leg for the Barbarian; pedestal and four corner wood. Red Oak is a wood known for being very hard, heavy, and strong. However, given its density, it is actually fairly easy to work. Like Hickory, it does have a coarse texture. Red Oak turns, carves, and bends well. It is also characterized by having excellent sanding and finishing properties, and great stability. Hard Maple is considered our stain grade Maple, because it is more consistent in color than its “cousin,” Soft Maple. The wood is characterized as dense, and light in color. Similar to our Soft Maple, Hard Maple is a fine textured and close grained wood that does not require filling. Cherry wood is moderately heavy, hard, and strong, and it also machines and sands to glass-like smoothness. Because of this, Cherry finishes beautifully. The heartwood in Cherry is red in color, and the sapwood is light pink. Components made of Cherry generally consist of approximately 25% sapwood and 75% heartwood. Walnut wood is dark, hard, dense and tight-grained. It's prized for its strength, grain and color. It polishes to a very smooth finish, and the color ranges from creamy white in the sapwood to a dark chocolate in the heartwood. Over the years, natural walnut wood develops a lustrous patina.